With the pages report in the traffic analytics tool, you can analyze and compare your content's performance using key metrics. Use the Date range and Frequency dropdown menus to filter the data by a specific time range. A week in the report starts on Sunday by default, when the date range selected consists of a week, or when the frequency is set to Weekly. By default, you'll see data for all of your pages. 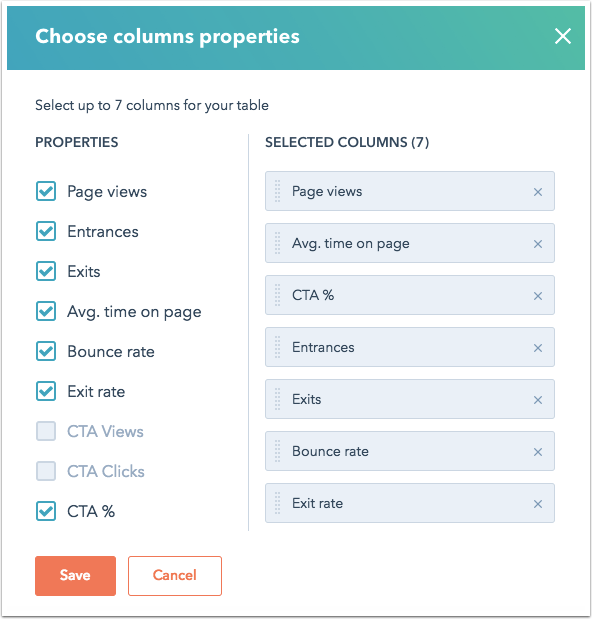 Click the Page types dropdown menu to filter by blog posts, landing pages, website pages, or knowledge base articles only. Page: title and URL of the page. Views: number of page views recorded in the designated time frame. Entrances: the number of times that a page was the first one viewed in a session. Exits: the number of times that a page was the last one viewed in a session. Avg. Time on Page: the average amount of time spent on a page. This is calculated by taking the sum of all page view durations divided by the total page views. This calculation excludes exits. Bounce Rate: the percentage of sessions that started on a page and did not move beyond that page. Exit Rate: the percentage of views on a page that were the last in a session. CTA Views: the total number of views for all calls-to-action on the page. CTA Clicks: the total number of clicks on all calls-to-action on the page. CTA %: percentage of page views resulting in a call-to-action click. This is calculated by taking the sum of all CTA click-through rates (percentage of views that resulted in a click) divided by the total number of CTAs on the page. Use the Style dropdown menu to change your chart type. You can choose an area chart, column, line, or a combination of an area and line chart in your data visualization. Below your chart, there's a table with detailed metrics for your pages. Use the search bar to search for a specific page. Select the checkbox next to a page name to view that page's metric in the chart visualization. Click any of the column headers to sort by that metric. To customize the columns that appear in the table, click Edit columns. Select the Properties checkbox to add a metric to your report. Click the X next to any of the Selected columns properties to remove it from your report. To re-order the selected columns in your report, click on a property and drag it into place. Please note: you can only display seven columns at a time in the pages report. Click Export to share a file with your report. Click Save as report to add this report to your dashboard. Learn more about analyzing the performance of an individual page, blog post, or knowledge base article. Please note: it is not possible to remove any pages from the report. The pages report shows historical data for every URL that has ever been crawled or received a view. Even if a page is removed or redirected, it will remain in the report to maintain the integrity of the analytics data for your website pages.